It’s a great team here at St John’s; their aim is to encourage all to join in with what God’s doing in the life of the community. Bruce is married to Caroline and together they have two boys, Joseph and Daniel. Bruce is a family man and enjoys spending time with his family, going for walks, cycles, having meals out and watching films. Bruce keeps fit by regular running. Bruce is passionate about Jesus and sharing the good news about Jesus with others. In his role as Vicar, Bruce loves to spend time with old and young alike and believes the church should play an active part in the life of its wider community. Bruce also believes the church should be a place of welcome, where the worship is engaging and accessible to all. 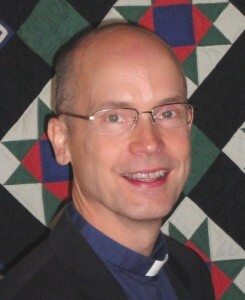 Prior to his ordination in 2004, Bruce held a senior role in banking. Elizabeth moved to Fareham as a four year old and attended St John’s from that time until her marriage to Herb in 1971. She returned to Fareham twelve years later, with her husband and three children: Rebecca, Gemma and Mark. Since that time St John’s has been a huge part of their family life. Mark and his wife, Amy, (now a curate at St John the Baptist, Locks Heath) attended St John’s, with their children; Rebecca attends the local Community Church with her family; Gemma lives in Huntingdon and attends a local church with her husband and son. Education has been an important part of both Elizabeth’s paid employment and voluntary work. Whilst working for HSBC, Elizabeth acted as schools’ liaison officer and subsequently worked as the school librarian at Wykeham House. She became a school governor (at Neville Lovett Community School and now called Fareham Academy), her children’s secondary school in 1991 holding the position of Chairman for approximately twenty years before finally retiring in 2017. This is Elizabeth’s second term as churchwarden; a job which she finds particularly fulfilling in trying to ensure that all the church family, and those arriving for the first time, enjoy a warm welcome. Brian became a Reader in 2001. Prior to his retirement, Brian was a different kind of Reader. In this case a Reader in Materials Engineering at the University of Portsmouth, this involved research and lecturing. Currently, he is focused on preaching, teaching and storytelling, and when time permits, hill walking. Presently his four grandchildren are all at universities. But, he maintains, life’s a school, and everyone a teacher. Chris was born in South Africa while her Dad was on government service over there. She returned, with her parents, to Gosport where she lived and went to school. After training at Gipsy Hill College of Education, she returned to Gosport and taught for 29 years at Siskin Junior School. Since retiring she has continued her interest in education by taking part in school assemblies, loves helping out at St John’s Messy Church and being a school governor. Chris became a Reader in October 1999. She is a tutor with the Living Faith course. Chris married Mike in 1972. Caroline is married to Bruce, the vicar at St John’s. They have two young boys and as well as being “Mum” Caroline works part-time in the NHS as an Occupational Therapist. When she has spare time Caroline enjoys swimming, reading, cooking and browsing in charity shops. Caroline arrived at St John’s with the family in the spring of 2015 and was licenced as a Reader in September 2015. This is a development in a life-long faith journey and many years’ involvement in children’s work and small groups in churches. Caroline is passionate about sharing the Good News about Jesus in ways which are both inclusive and life-changing. Ian has been a member of St John’s from the age of 18 and was licensed as a Reader in 1993 and is also sub-warden of Readers for the Fareham Deanery. Ian married Sally in 1987, and they have two children Ellen and John. Ian and Sally are both involved in running Messy Church. Ian completed a BA in Church and Community Studies in 2004, and worked in Education for 14 years, beginning as a learning support assistant and rising to Deputy Head Teacher at the local secondary school until April 2014. Ian is currently enjoying a sabbatical from work, transforming his garden and having trained his chocolate coloured Cocker Spaniel called Josie to do useful things like fetch the tv remote, is now training his new puppy (a brown, white and black coloured girl Cocker Spaniel called Charlie) for even greater things. In his free time, Ian is a season ticket holder at Saints FC, enjoys watching films, eating out and keeping up to date with latest technologies. Jeannette has been a member of St. John’s since 1998, has two children and four grandchildren and completed a BSc degree in Geological Studies and Associated Sciences in 2000. Jeannette enjoys music and plays piano and treble recorder, sings with “Solent Sounds” Ladies Sweet Adeline Chorus and enjoys socializing and meeting friends for coffee and meals. Jeannette has been a Reader since 2006 and is St. John’s Pastoral Care Co-coordinator. Jeremy grew up in Nottingham, and moved to Fareham shortly after graduating from university. A few months later he met Rachel at a Lent study group, and they celebrated their 25th wedding anniversary in March 2013. Jeremy became a Reader in 1998, serving for six years in our neighbouring parish of Holy Trinity with St Columba before moving to St John’s. Jeremy works as a software engineer in the digital television industry. In his spare time he plays cricket, badminton and table tennis; he is a keen cyclist, enjoys puzzles and quizzes, and is interested in languages and music. He is the fixture secretary of the local indoor cricket league, the secretary of the Fareham Fairtrade group, and the webmaster of the Hampshire Fairtrade Network; and together with Rachel he is the co-ordinator for Christian Aid in Fareham and Portchester. Jo-Anne moved to Fareham at the age of 7 and was part of the St John’s family until she was 16. She has a degree in Applied Chemistry and worked at Cyanamid in Gosport where she met her husband Graham. They have been members at St John’s since 2010. Jo-Anne now works for the NHS and also has been a volunteer hospital chaplain since 2004. She became a Reader in 1998 and is currently licensed to Queen Alexandra Hospital as she has a passion for prayer and healing ministry. In her spare time Jo-Anne enjoys baking, knitting, playing bowls and watching cricket.